"A local petition calls for the town Board of Health to institute a policy in which the sale of flavored tobacco and nicotine products be restricted to so-called “vape” stores that only those 21 and older can enter. The petition, started by Westwood-Mansfield Pediatric Associates, seeks 200 signatures, although it is non-binding. Health board members discussed the topic during regularly scheduled meeting on Wednesday. Currently, flavored tobacco and nicotine products are also sold at several convenience stores and gas stations in town. Owners either failed to respond or declined to comment on queries made by a Daily News reporter on the subject." 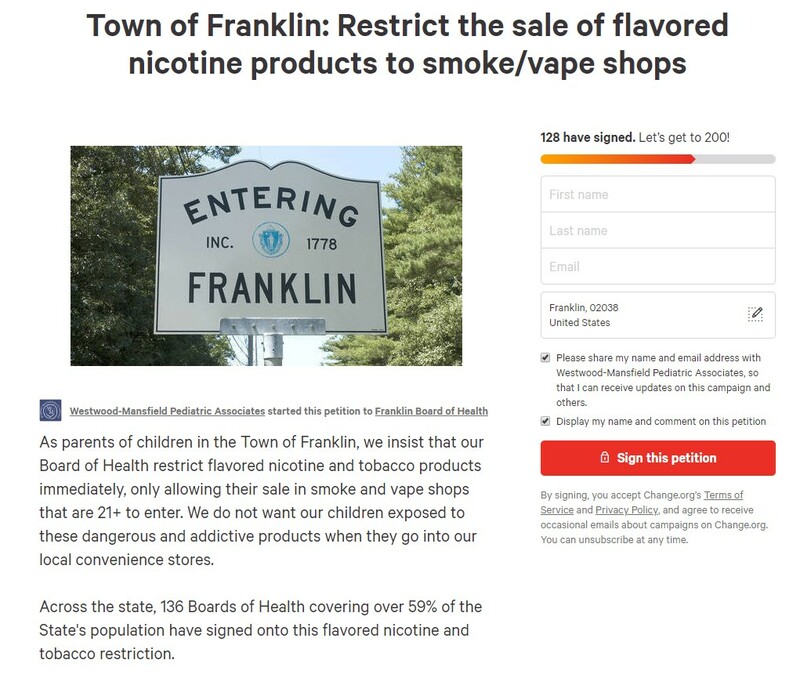 "As parents of children in the Town of Franklin, we insist that our Board of Health restrict flavored nicotine and tobacco products immediately, only allowing their sale in smoke and vape shops that are 21+ to enter. We do not want our children exposed to these dangerous and addictive products when they go into our local convenience stores. Across the state, 136 Boards of Health covering over 59% of the State's population have signed onto this flavored nicotine and tobacco restriction. Given the current nicotine addiction epidemic in our middle and high schools, it is this Board's duty to look out for our children and attempt to remedy this situation."